We need to defeat Islamic State – but how? A genuine, if brief, debate took place amongst the political classes in the UK on the dangers of intervening or not in Syria. But it seems that we live in a world of amnesiac thinking driven by fine words and high ambition rather than clear strategy. 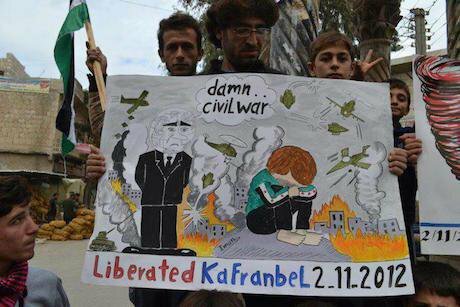 Demotix/Liberation KaFranbel. All rights reserved.A genuine, if brief, debate took place amongst the political classes in the UK on the dangers of intervening or not intervening in Syria in advance of the British Parliament’s vote to expand its military action from Iraq to Syria. But it seems that we live in a world of amnesiac thinking driven by fine words and high ambition rather than clear strategy. The reality of the murkiness of war and the fog of peace are much more disturbing. Prime Minister Cameron’s arguments for going to war sounded rational and convincing on first reading. The reality is much more troubling, and we are at risk of repeating the past failures of Iraq, Libya and Afghanistan. Are western leaders falling into the same traps, as Islamic State (IS) is intent on provoking and expanding the war? Whilst there is an understandable desire to hit back after the terrible bloodshed of Paris and for the UK to show its solidarity with France against such barbaric acts, the question that always needs to be asked is whether military intervention makes us safer or whether we have succumbed to wishful thinking that has left us blind to the lessons of our past 12 years of direct military involvement in the Middle East. Each of our interventions has created even worse chaos than there was before and has resulted in growing support for jihadi extremists. Hilary Benn, a principled politician, gave a passionate speech last week in the House of Commons arguing the moral case for airstrikes. He called IS a fascist organization and said that we must fight such evil. But the speech suggested a moral clarity that we all search for but that is not so evident. We are not fighting the same war that we fought against Nazi Germany. That war was state-to-state where Germany had amassed a huge military machine. Whatever its grandiose ambitions, IS is a non-state actor of rather modest means. Its army has reportedly remained relatively steady at around 20,000–30,000 fighters. Its budget, though huge by insurgent standards, is tiny compared to those of real states. Nevertheless, it does have the ability to conquer and hold territory, destabilize the region, and inspire deadly terrorist attacks elsewhere. IS does represent a substantial international terrorism threat, as evidenced in Paris, Istanbul, Beirut and Sharm el-Sheikh but it is not an existential threat to Europe. The lesson of the Second World War was that weakness was a dangerous response to force and those martialing the greatest military power would ultimately win the war. Our current experience challenges this old logic. The nature of warfare has fundamentally changed and the use of conventional military force alone seems incapable of winning such wars. War no longer only consists of state-on-state fighting, but civil intra-state conflict. In this context, we need to differentiate between when the conventional use of force can be effective, and when it cannot. Moral clarity is comforting for all of us with indicators of good and bad behaviour – but in war everybody is behaving badly. There is little to suggest a clean war and the problem is that all sides including Iraqi and even Kurdish forces have been implicated in atrocities – there are reports of Sunni Arab homes burnt as the Kurds liberated Sinjar – while Assad is causing far greater suffering than IS with his barrel bombs killing eight times more citizens than IS forces. But in the horrid and messy complexity of war, ordinary citizens who are living side-by-side with death have turned to more extreme jihadi groups for protection. In the quagmire of war, we see the deterioration of human behaviour. Those who previously lived side-by-side become trapped in hatred and the desire for retribution. A kind of insanity emerges in which, according to Samar Yazbek in her book The Crossing: My Journey to the Shattered Heart of Syria, “during battle, we are not human. We are animals. It is either kill or be killed”. The whole point of terrorism, and particularly the form of terrorism we are seeing in Syria, is to create chaos and exacerbate the disturbance amongst communities, stimulating sectarian violence and rigid and hardened thinking. That does not ever mean that we can morally justify terrorism – it is the rotten fruit of despair where people and populations have become monstered by the agonies of war. But it doesn’t come from nowhere, and reflects the terrible political vacuum in the region. In spite of the poisonous ideology that has emerged, many people feel safer under the harsh rule of IS than under the chaos of the war in the region and the experience of being displaced. Some citizens from the refugee camps of Turkey choose to return because life under IS offers greater protection. We do see the inexorable global spread of jihadi ideology on the streets of London, Brussels and Paris, with armed conflict spreading from the war zones of the Middle East to Europe. But tragically, what happened on the streets of Paris happens every day in Syria. As a result of IS' attack on Paris, Raqqa has become the focal point of coalition military strikes. But it is also the home of hundreds of thousands of civilians who now fear coalition air strikes more than they fear IS. Many of the locals will be enraged by the pounding of their city and the destruction of their infrastructure. The challenge of European decision-makers is to keep their communities safe but the answers may require a less dramatic response than explosions in Raqqa. Something more prosaic may be required, like better intelligence, policing and better communication between European states and agencies. The distress and outrage of Paris makes governments feel they must be proactive in protecting their citizens. There is a harsh reality that military intervention is more likely to increase feelings of alienation and marginalization, strengthen radicalization and stimulate sleeper cells and ‘lone wolves’ within Europe. According to terrorist expert Scott Antrim, IS is attempting to exploit “the disheartening dynamic between the rise of radical Islamism and the revival of the xenophobic ethno-nationalist movements”. Whilst we do need to be doing something in the UK, our actions could have a more constructive role that is not dependent on its fighter jets thumping IS heartlands. Destroying IS may prove to be an impossible task even with a grand coalition. If we succeed in Syria, similar groups are already strengthening in Libya and parts of West Africa. In any actions against IS, we will need to avoid playing into its strategy and be smart about how we reverse and degrade its gains. It will require a very long-term commitment, decades not years, in order to provide time for social, economic and educational actions among disaffected Arab and Muslim populations. Frustration tends to be highest in countries that have an emerging population of educated young men and women who have undergone multiple shocks, frustrations and displacements in their search for identity, dignity and prosperity. This is a slow game. In the immediate, the UK’s military participation is minor and by choice rather than necessity. Traditionally, military involvement gives states a place at the diplomatic top table but we could consider a more constructive role to reach this political position. This would be based not on our precision bombing but on our quiet diplomatic skills. The talks in Vienna to resolve the Syrian war are gaining some traction but quiet diplomacy behind the scenes is still needed. A critical component will be focusing on the proxy war and the long-term interests of Iran and Saudi Arabia and finding some accommodation between them. The UK could take a lead in such diplomacy. It would provide the opportunity for the UK to be more proactive in this role as peacemaker and not warmonger. Yes, we do need to fight fascism, and yes, we need to act but is there a comprehensive strategy to win hearts and minds or just a short-term military response that looks like we are doing something?